I make a concerted effort to eat healthy foods most of the time. You know - the good stuff - vegetables, fruits, whole grains, legumes, nuts, lean protein, etc. I firmly support Michael Pollan's oft-quoted eating mantra: "Eat food. Not too much. Mostly plants." But I still like to have to treat myself sometimes...and one of my favourite treats is a grilled sausage. I know it's terrible - it's laden with sodium and saturated fat (even the really yummy high-quality ones that I get from my local store), but dammit, it's so good. 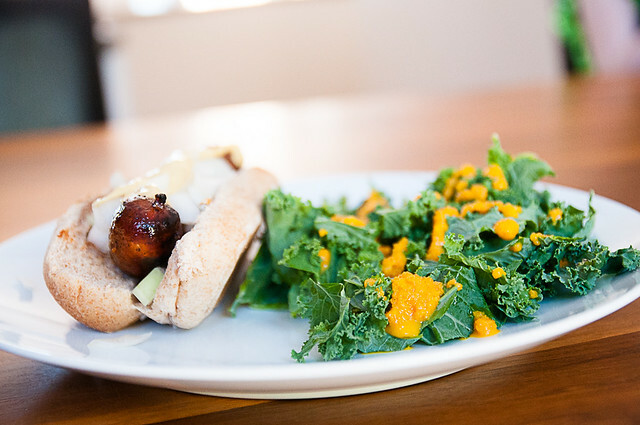 So when I splurge on a yummy sausage, I like to balance it out with healthy sides. The healthier the better. And dark green and orange veggies are pretty much among the healthiest foods around, so why not pair shredded kale (which I LOVE in salad, and I don't care if cauliflower IS the new kale...I still love kale salad) with a carrot dressing. I've never eaten carrot-ginger dressing at a Japanese restaurant. So I have no idea if this is 'it' or not. But I can tell you that this is delicious. It has loads of natural sweetness from the carrots (and a bit of unnatural from the vinegar), richness from the sesame oil, acidity from the rice vinegar and saltiness from the soy sauce. The shallots round out the flavour really nicely (I thought it was strange, initially, that there was no garlic in this, but the shallots step up to the plate (and to the palate - you're going to want some gum after this). 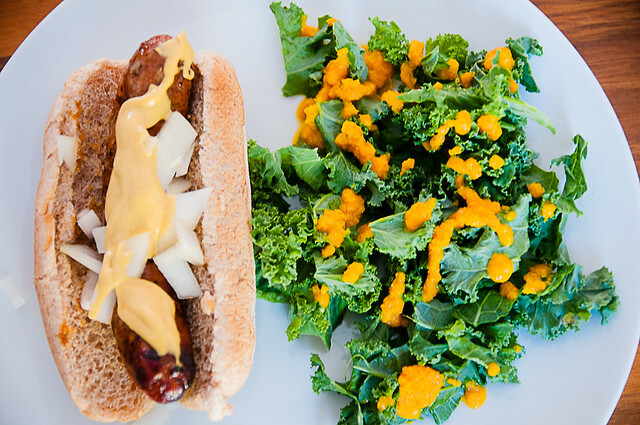 Anyway, all this to say, I enjoyed a completely delicious spicy grilled sausage with onions and dijon, and paired it with shredded kale salad and carrot-ginger dressing. It was good. And if you have a stocked pantry, you could probably make this salad dressing right now. So I'll stop now and leave you to go do that. 1. 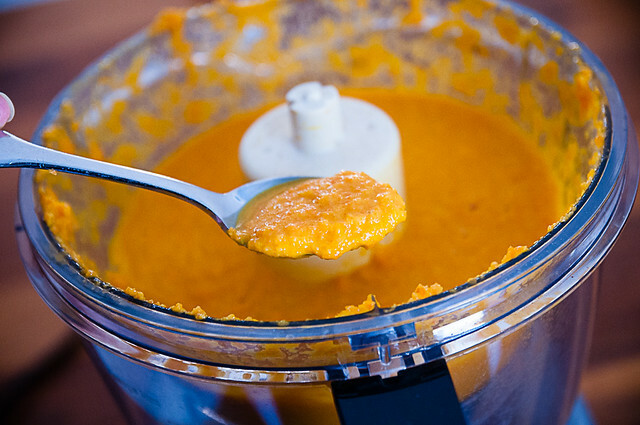 Add all ingredients except for oil and water into food processor and process until pretty smooth. 2. Slowly add oil (while food processor is still running, assuming your processor has a tube so you can safely do this), then slowly add water. Continue processing another 2-3 minutes. If you want a perfectly smooth dressing, you can blend after processing, but I like it a bit chunky. It's so incredibly flavourful. I think it would also be a great sauce on grilled chicken, or steamed green beans or even as a dressing in a noodle salad. Love carrot and ginger together. Not that I know what it tastes like but I think I would have it with steamed broccoli and cauliflower and a baked yam...yum! Will have to try it on the weekend. Samantha - I bet it would be great on broccoli!